The point of Levitt’s article was that businesses should focus on customer needs rather than business ideas. The illusion that a firm is in a growth industry is a common one. There are no growth industries! Presumptive growth is not guaranteed. They instead need focus on the vision of customer needs. You are not in the business of a particular industry, you’re in the business of customer value creation. People cannot accurately predict the future and therefore there is no such thing as a growth industry. 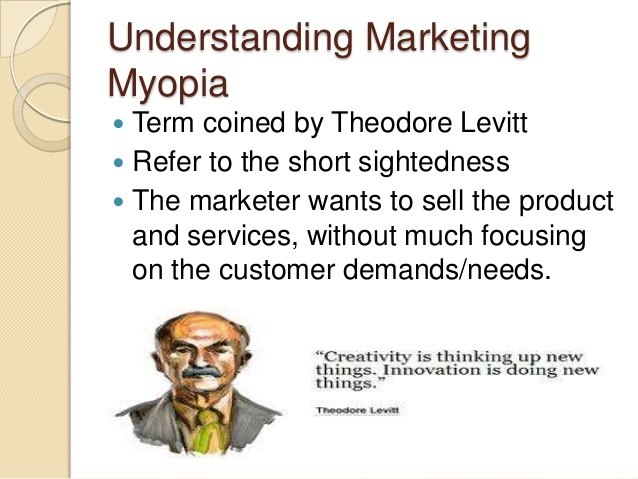 Management needs to see the broader market; you need to be single minded about what the customer wants. Too narrow understanding of the customer / narrow industry view. Examples, Petroleum = Energy not oil! Corner Store = Food distribution not retail groceries! Buggy = Transportation not horse and carriage! If the management understood that they were in the transportation industry not in the horse and carriage industry; they might well have avoid the decline of GM in the 2000s. The idea with Big Bang Disruption is it is an article that buildings on Christensen’s Crossing the Chasm. They aren’t trying to disrupt you, you’re banker job is just part of the debris. Unconstrainted growth: there are the 5 segments by Everett Rogers Crossing the Chasm, now there are trial users. Undisciplined strategy: start life with a better performance at a lower price. Venmo; faster cheaper. Not trying to disrupt your business, you’re business is collateral damage. Be ready for the fast escape. Consult your truth tellers: candor Jack Welch. Move to a new singularity. Strategic Discipline: Compete on all three disciplines at once. New-Product Marketing: Market to all segments of users immediately. Be ready to scale up and exist swiftly. Innovation Method: rapid-fire, low-cost experimentation on popular platforms (Reddit, Facebook, Twitter)d onto the technology needed to deliver the Model-T.